At 18:56 hrs a two-car Metro train, travelling from South Shields to St James, arrived at Walkergate station. While standing in the station an electrical fault occurred to a line breaker mounted on the underside of the train, which produced some smoke. It also caused the circuit breakers at the sub-stations supplying the train with electricity, via the overhead line, to trip (open). About one minute later power was restored to the train. There followed a brief fire in the area of the initial electrical fault and further smoke. 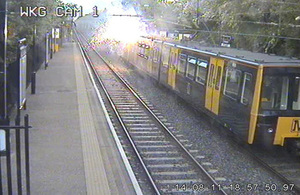 Shortly afterwards, the overhead line above the train parted and the flailing ends of the wire fell on the train roof and one then fell on to the platform, producing significant arcing and sparks for around 14 seconds. Fortunately, there was no-one on the platform at the time. However, there were at least 30 passengers on the train who self-evacuated on to the platform using the train doors’ emergency release handles. The fire service attended but the fire was no longer burning. No-one was reported to be injured in the accident and there was no significant damage to the interior of the train. Our investigation is independent of any investigations by the safety authority. We will publish our findings at the conclusion of the investigation. The report will be available on our website. You can subscribe to automated emails notifying you when we publish our reports and bulletins. We would like to hear from any passengers who were on the train. Any information provided to assist our safety investigation will be treated in strict confidence. If you are able to help us please contact us by email on enquiries@raib.gov.uk or by telephoning 01332 253300.